Rebecca Dunn lives and plays in Aberdeen. 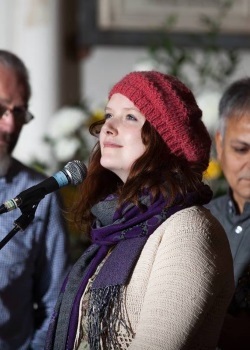 With a background in traditional Scottish music through her upbringing in the Black Isle and involvement with the Fèis Rois, Rebecca crafts original material that expresses her passion for folk music but gives it a contemporary twist. Rebecca frequently performs solo in Aberdeen and at various Scottish festivals. Her solo music has been compared to the work of Ivor Cutler in its playfulness, and her voice has been called angelic, haunting and ethereal: a combination that captures audiences. Rebecca is one of the founding members of the Aberdeen-based Melting Pot Collective, a project that appealed to her interest in blending styles. The Melting Pot Collective has gone on to represent multicultural music in the North-East of Scotland and to act as a hub enabling many cultural groups and individuals to work towards giving performances together. 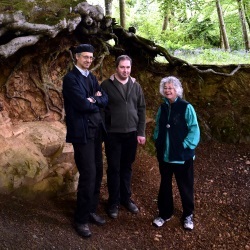 Rebecca's way into Intuitive Music Aberdeen began when member Haworth and Rebecca, who were meeting through the Melting Pot Collective rehearsals, began to experiment musically through a shared appreciation for improvisation and unusual form. Through this experimentation and subsequent performances as a duo, Rebecca was able to flex her intuitive muscles and get a taste for intuitive music. She was delighted to be asked to join Intuitive Music Aberdeen in 2017. One of the things that thrills Rebecca the most is singing intuitively, completely unscripted, especially with fine musicians who can weave in and out and intuitively respond to her style as she responds to theirs. Rebecca says of this: "What an absolute thrill. This brings me a lot of pleasure, but I can see how much pleasure it can bring to audiences too, as every single time I do it I respond to their moods, the mood of the room and the space we are in, and these things inform the performance, creating a truly unique experience every time. Having the chance to connect with audiences in this way is a dream come true!" In Intuitive Music Aberdeen, Rebecca sings and plays ukulele and electronic keyboard.